A new study conducted by Drexel University environmental sociologist Robert J. Brulle, PhD, exposes the organizational underpinnings and funding behind the powerful climate change countermovement. This study marks the first peer-reviewed, comprehensive analysis ever conducted of the sources of funding that maintain the denial effort. Through an analysis of the financial structure of the organizations that constitute the core of the countermovement and their sources of monetary support, Brulle found that, while the largest and most consistent funders behind the countermovement are a number of well-known conservative foundations, the majority of donations are “dark money,” or concealed funding. 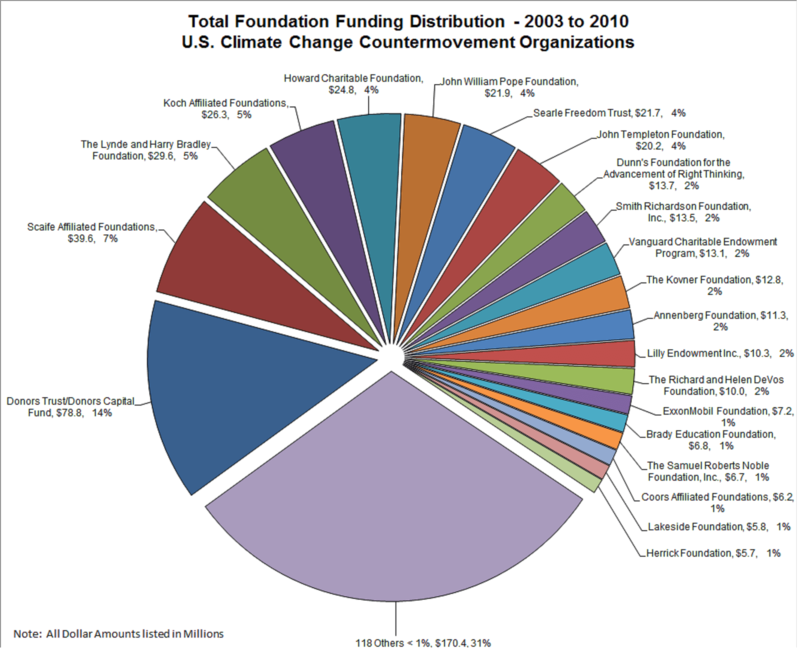 The data also indicates that Koch Industries and ExxonMobil, two of the largest supporters of climate science denial, have recently pulled back from publicly funding countermovement organizations. Coinciding with the decline in traceable funding, the amount of funding given to countermovement organizations through third party pass-through foundations like Donors Trust and Donors Capital, whose funders cannot be traced, has risen dramatically. Brulle, a professor of sociology and environmental science in Drexel’s College of Arts and Sciences, conducted the study during a year-long fellowship at Stanford University’s Center for Advanced Study in the Behavioral Sciences. The study was published today in Climatic Change, one of the top 10 climate science journals in the world. The climate change countermovement is a well-funded and organized effort to undermine public faith in climate science and block action by the U.S. government to regulate emissions. This countermovement involves a large number of organizations, including conservative think tanks, advocacy groups, trade associations and conservative foundations, with strong links to sympathetic media outlets and conservative politicians. The final sample for analysis consisted of 140 foundations making 5,299 grants totaling $558 million to 91 organizations from 2003 to 2010. The data shows that these 91 organizations have an annual income of just over $900 million, with an annual average of $64 million in identifiable foundation support. Since the majority of the organizations are multiple focus organizations, not all of this income was devoted to climate change activities, Brulle notes. Most funding for denial efforts is untraceable. Despite extensive data compilation and analyses, only a fraction of the hundreds of millions in contributions to climate change denying organizations can be specifically accounted for from public records. Approximately 75% of the income of these organizations comes from unidentifiable sources. April 11, 2018 - Climate Change Is Weakening a Crucial Ocean Current Discover MagazineEurope and the east coast of North America benefit from a massive system of circulating seawater called the Atlantic Meridional Overturning Current. October 29, 2012 - Climate Crimes Against Humanity? ForbesLast week PBS aired Frontline's “Climate of Doubt,” documenting the success of the denialists in reversing U.S. political opinion on climate science. September 19, 2017 - NASA Nominee Wants to Study Climate Change--on Mars Scientific AmericanThe Trump administration's nominee to lead NASA wants the agency to study climate change on Mars, even as he questions if it's happening here on Earth.